Are you excited about this years Coconut Grove Pumpkin Patch? My kids sure are! Now, all Florida Free and Frugal readers have an opportunity to win a family pack of tickets to the Coconut Grove Pumpkin Patch festival, which is a $30 value. See below for details. GoGo squeeZ is giving away 4 tickets to the Coconut Grove Pumpkin Patch Festival to Frugality Is Free and Florida Free and Frugal's readers. Under). Prizing is good for either day. To enter simply fill out the Rafflecopter form below, answer the question, and take advantage of the extra entries to increase your winning chances. Find out more information about the Coconut Grove Pumpkin Patch here and at the Coconut Grove Pumpkin Patch Facebook page. This giveaway will end Monday September 24th at Midnight EST. The giveaway is open to US residents, 18 years old or older – only one entrant per household. I will chose the winner via Random.org, and the winner will be notified by e-mail. Make sure to leave your email, or have your contact available on your blogger profile. The winner will have 24 hours to respond, and if there is no response another winner will be chosen. Disclaimer: The Frugality Is Free family will receive special tickets to the Coconut Grove Pumpkin Patch Festival in exchange for hosting this giveaway. No monetary compensation has been received. 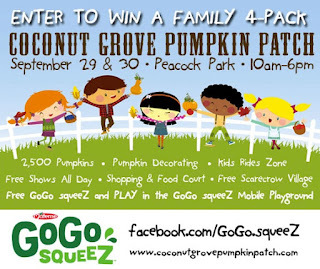 The Coconut Grove Pumpkin Patch Festival ticket giveaway is sponsored by GoGo squeeZ. 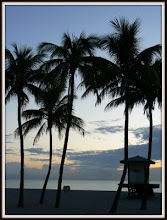 You can learn more about the Coconut Grove Pumpkin Patch here and at the Coconut Grove Pumpkin Patch Facebook page.